Wife wasn’t happy with the reach and action of the OEM levers so I ordered up an inexpensive set from eBay seller rzmparts. $20.46 shipped from China. Today, I installed the levers. They fit perfectly, look great, work great and offer 6 different levels of reach adjustment, allowing my wife to find a better fit. G0MYW and W8NONU like this. I am considering doing the same, was the removal and installation of the leavers easy? Any tips? I installed some similar (full length) levers. It was very easy, although you must be a little careful with the brake master cylinder push rod. I had one issue. The end of the levers do NOT bend out like the OEM levers. The end of my clutch lever hit the bar end and with the positions 1 to 3 for reach I found the clutch start interlock switch did not work. I had to very slightly bend the end of the clutch lever so the when the lever was fully pulled it, it touched along the hand grip and not the bar end. The clutch interlock start switch works now. It’s very simple You will need a 5mm Allen wrench, an 8 mm box or socket wrench for the clutch side and 2x 10mm box or socket wrench for the brake side. Start by removing the nuts on the underside of the levers then remove the bolts. Adjust the clutch cable barrel adjuster to to provide slack in the cable. 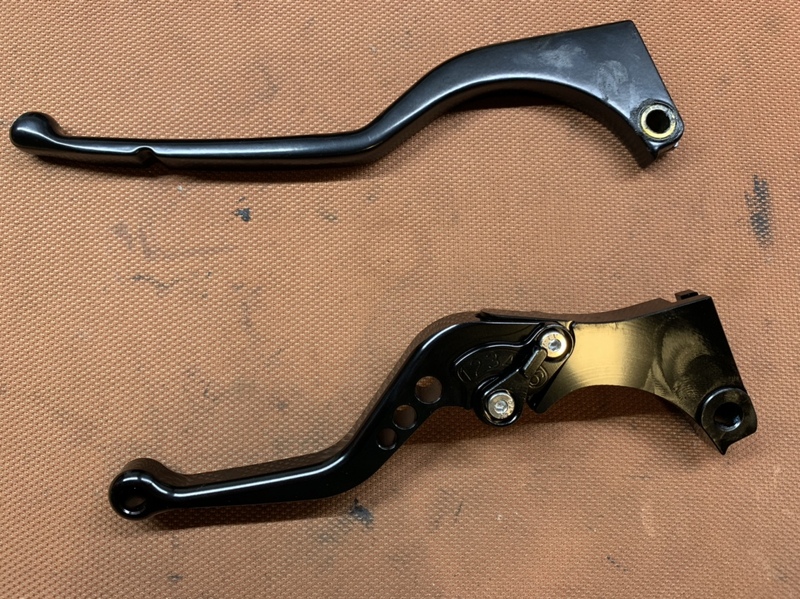 Disengage clutch lever from the cable, and brake lever from the brake master cylinder assembly. Reassemble with new levers, grease and reinstall bolts, and nuts. Viola! You do need to mind the brake actuator pin (inserts into lever) It’s a 15 minute job. Last edited by Baldazzer; 03-28-2019 at 05:36 AM. The levers I purchased had no such issues. Fitment is perfect. can you be so nice and send the link to these levers? thanks but many levers come up from that link. actually, error link. Last edited by Kris; 03-31-2019 at 07:44 AM. I just completed the installation of the new levers. It took about 10 minutes. Easy Peasy. Are you sure these fit 100%, no contact with switch block... you can fully disengage the clutch with levers in position 1 through to 6?